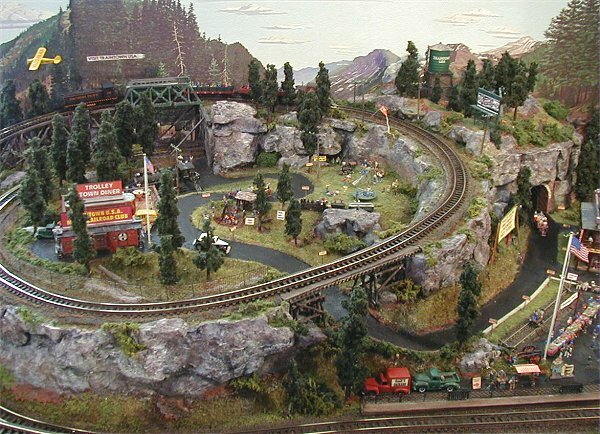 The 2002 Great American Train Show in Pleasanton, CA. We (my daughter Brandie and I ) went to this show Saturday 11/29/02. As always I made a list of things I wanted to find, and came home with everything ELSE than what was on my list. :) The GATS people put on about 60 shows a year. Mostly we go to see the layouts though. We arrived 1/2 hour early and there was a long line around the building, but only about a tenth as long as the line at the NMRA National. The doors opened on time and within minutes were inside. There were quite a few N-Scale layouts this time. And they were all quite well detailed like this one nearest the entrance.